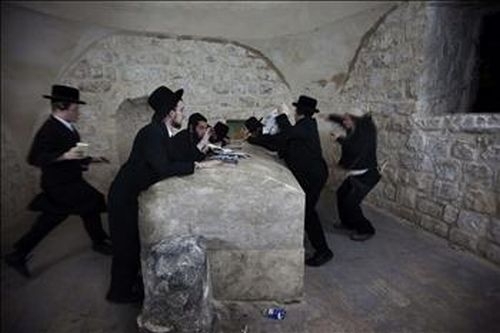 Dozens of settlers stormed Thursday, Joseph Tomb in Nablus under the protection of Israeli Army Forces, which imposed a full closure on the eastern neighborhoods in the city, especially areas close to the tomb. Witnesses reside near the tomb told Quds.com that settlers arrived to the tomb via busses, broke into the tomb and performed their religious rituals that lasted till the early hours of the morning. It's worth mentioning that Israeli forces raided at dawn several neighborhoods in the city and searched a number of houses. No arrests were reported. 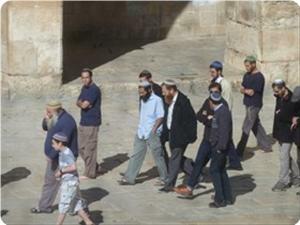 Israeli settlers and elements of Shin Bet broke into al-Aqsa mosque on Tuesday from the Mughrabi Gate under tight security protection. Nearly 15 elements of Shin Bet (the Israeli Intelligence service) have stormed al-Aqsa mosque Tuesday morning, while another group, includes 15 settlers and 50 soldiers, broke into the mosque as part of the Israeli discovery tours in the mosque, Al-Aqsa Foundation for Endowment and Heritage said. The foundation pointed out that a state of alert has prevailed in al-Aqsa mosque since Sunday where a large number of Israeli soldiers are deployed in its courtyards, while a state of anticipation has prevailed among the students. The Israeli break-ins into al-Aqsa mosque came following the interior and environment committee of the Knesset's session, held on Sunday, to table a proposal calling for allowing the Jews to desecrate the Aqsa Mosque, a holy site for Muslims, to perform their rituals, especially during their religious days and festivals as part of the Israeli schemes to divide the mosque between Muslims and Jews as what happened with the Ibrahimi mosque. For his part, the Grand Mufti of Jerusalem and the Holy Land, Sheikh Mohammad Hussein, warned of the serious implication of the Israeli government's decision to open the mosque gates to the Jewish settlers. He pointed out that the Israeli break-ins and attacks into al-Aqsa mosque and Islamic and Christian holy sites have escalated. The Grand Mufti stressed the need for an Arab, Islamic and international interference, warning of religious war erupting in the region. For his part, Dr. Najeh Bkeirat the director of manuscripts department at Al Aqsa Mosque accused the Palestinian Authority (PA) of providing cover to the Israeli continued break-ins to the mosque. The Israeli escalated attacks against al-Aqsa mosque are due to the PA's decision to resume peace talks with the occupation, he added. Bkeirat criticized the PA minor role concerning the Palestinian fateful issues, pointing out that talks resumption liquidated Jerusalem and Palestinian land issue. Israeli housing minister Uri Ariel and head of the municipal council in occupied Jerusalem Nir Barkat laid the foundation stone for the construction of a new settlement outpost in Jabal Makbar neighborhood, east of the holy city. According to the Aqsa foundation for endowment and heritage, the new outpost will be composed of 63 housing units to be inhabited by ultraorthodox Jewish settlers. 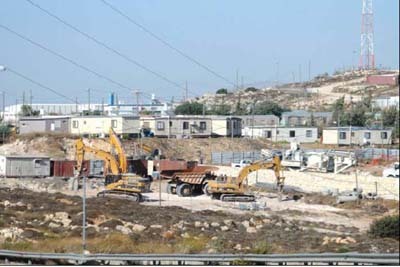 The new plan will be carried out by the Zionist settler group Emunah, which had already built a parking lot for this outpost five years ago, but it did not finish the project as a result of the legal battle that took place between the Palestinian owners of the area, about 3000 square meters, and the group. After the Palestinian owners lost their legal battle against Emunah, the Israeli government blessed and sponsored the plan. Spokesman for the Israeli premier Mark Regev said that these housing units, whose construction was approved by the government, are located within the areas that would remain under Israel's sovereignty in any future peace treaty with the Palestinian authority. As early as the summer of 1995, the Iraqi born Israeli – British "new historian" Avi Shlaim wrote in the Journal of Palestine Studies: "The settlers now are the ones who determine Israel's internal political agenda." Their numbers then were in the tens of thousands; now there are three quarters of a million settlers. The Head of the "Samaria Regional Council" of the Israeli illegal settlements in the Israeli – occupied Palestinian West Bank (WB) of River Jordan, Gershon Mesika, on this August 6 boasted there will be one million settlers there "in just three years time," telling "Arutz Sheva" online that "the settlement enterprise in Judea and Samaria (i.e. the Palestinian WB) has passed the point of no return." Writing in the "National Interest" on September 6, 2012, the President of the U.S./Middle East Project, Henry Siegman, agreed that "Israel's colonial... settlement project has achieved its intended irreversibility, not only because of its breadth and depth but also because of the political clout of the settlers and their supporters within Israel." When Benjamin Netanyahu assumed his second term as prime minister, with the settler Avigdor Lieberman as his foreign minister, the German Süddeutsche Zeitung, quoted by Spiegel on March 17, 2009, wrote: "He and Lieberman are the gravediggers of the Middle East peace process. 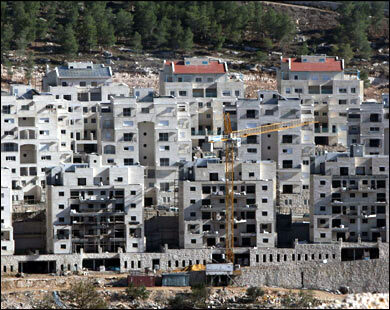 They want to maintain the occupation and expand the settlements." The electoral campaign of Netanyahu for his first term in 1995 was blamed by Israeli media for creating the right environment which led to the assassination of the "father' of the first Oslo accord for peace with Palestinians in 1993; ever since the "peace process" has been deadlocked. 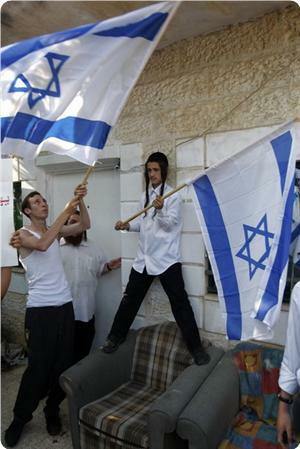 The incumbent government of Netanyahu's third premiership is now described as the "settlers' government" or "a settler –friendly government," the survival of which is secured by a Knesset led by Speaker Yuli Edelstein, himself an illegal settler of the Neve Daniel colony in the WB, who called recently for the annexation of two thirds of the WB area. This is a call that was also repeatedly voiced by the pro - settler Jewish Home party, a partner to Netanyahu's ruling coalition, which holds three key ministries, including the housing ministry, and controls the parliamentary finance committee. Netanyahu declared his backing for the Jewish Home's plan. Minister of Economy Naftali Bennett was the chairman of the council of the illegal settlements in the WB and Gaza Strip and is still an advocate of imposing Israeli sovereignty unilaterally on "Area C" in the WB. Uzi Landau, of Lieberman's Yisraeli Beiteinu party, has the tourism portfolio. Likud's ardent supporter of settlements, Moshe Yaalon, has the ministry of defense. Foreign minister's deputy, Zeev Elkin, is himself a settler. The education minister, Shai Piron, of Yair Lapid's so-called "centrist" Yesh Atid party, is a settler rabbi; Lapid himself who is the finance minister supports the "growth" of settlements even during peace talks and rejects any Palestinian sovereignty under any pact in eastern Jerusalem. Deputy Minister of Defense, Danny Danon of Likud, was quoted by The Jewish Press on August 8 as saying that the "views" of Israel's chief negotiator, the Justice Minister Tzipi Livni, whose Hatnua party holds six seats only in the settler –dominated Knesset, "do not represent the majority of the current government." Livni's role in Netanyahu's "government of settlers" seems a cosmetic one intended only to circumvent the U.S. pressure for the resumption of the peace talks. In Israel's proportional system, the voting settlers and the pro – settler political parties and groups have over the years accumulated enough political clout that is far – in – excess of their numbers to determine the internal balance of power, decide the electoral outcome and dictate their own agenda. They are holding the system hostage. So far they have become the real killers of peace. On July 28, 2013, Barak Ravid wrote in Haaretz that Netanyahu "is acting so weak ... like a prisoner ... a hostage" of his pro –settler coalition partners. 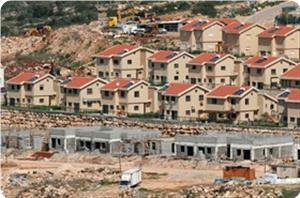 During the interval between the first and the second rounds of the recently resumed negotiations, Israel approved a "new" settlement and 1700 settlement units in eastern Jerusalem; the government included 90 settlements in a new list of "national priority development areas" eligible for special benefits; the list included also the three formerly dubbed by the Israeli government as "illegal outposts," namely Bruchin, Rachelim and Sansana. On August 11, 2013, the U.S. Secretary of State John Kerry reacted by reiterating from Bogota, Colombia his country's "unchanged" position since 1967: The U.S. "views all of the settlements as illegitimate" and had "communicated that policy very clearly to Israel." Ironically, "Israel's settlement project" has evolved "irreversible" nonetheless, mocking the U.S. repeatedly declared illegitimacy thereof as merely a lip service that has been all throughout a thinly veiled cover of the U.S. actual protection of the accelerating expansion ever since of "Israel's colonial" project. No surprise then Kerry from Colombia "expected" what Peter Beinart described in the Daily Beast on August 12 as the "Opening of settlement floodgates" just two days ahead of the second round of the U.S. – sponsored Palestinian – Israeli negotiations, which were resumed in Washington D.C. on July 29, 2013. Worse still, Kerry pragmatically defended the new "opening of settlement floodgates" as an incentive which "underscores the importance of getting to the table ... quickly," ignoring insensitively the Palestinian reaction. On May 18 Palestinian President Mahmoud Abbas said Netanyahu must choose between settlements and peace. Secretary General of the Executive Committee of the Palestine Liberation organization (PLO), Yasser Abed Rabbo, and the PLO chief negotiator Saeb Erakat said they were considering not to participate in the second round of the talks, scheduled in Jerusalem on August 14. Member of the Executive Committee of the PLO, Hanan Ashrawi, condemned Israel's latest settlement plans as "confidence-destruction measures." Her co – member, Wasel Abu Yusuf, concluded that the PLO committed a "big mistake" by joining the Kerry – sponsored talks. Spokesman for the Palestinian presidency, Nabil Abu Rudeineh said that Israel's latest plans "aim at obstructing the peace efforts." However, the PLO is too weak to translate its words into deeds and challenge kerry's statement that the issue of settlements should not derail the resumed peace talks. Americans for Peace Now, in a report titled "Settlements & the Netanyahu Government: A Deliberate Policy of Undermining the Two-State Solution," said that in "its policies and actions" this government "disclose a clear intention to use settlements to systematically undermine and render impossible a realistic, viable two-state solution to the Israeli Palestinian conflict." In a roundtable on the sidelines of the Clinton Global Initiative in New York on September 22, 2011, former U.S. President Bill Clinton blamed the "Netanyahu administration" and what he called a "demographic shift in Israel," which was an indirect reference to the settlement project, for the failure of the peace process. In "A Message from a Longstanding Zionist to the Israeli People," Robert K. Lifton, a former president of The American Jewish Congress, on this August 8 urged Israelis that they "must make clear the direction they want their country to pursue," "separate Israel from the Palestinians," and "avoid being ensnared in a bi – national state." However, Lifton's appeal sounds like a cry in the settlers' wilderness. 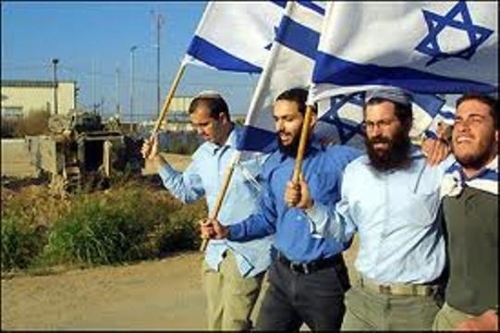 Israelis have yet to liberate themselves from being hostage to these killers of peace. Until then, Israelis will continue to navigate without compass, rejecting the one – state solution, the two – state solution, the bi – national state solution and every other proposed solution for peace, except their peace – killing colonial settlement project, which Henry Siegman, referred to by The Forward on October 5, 2012 as a "Jewish elder statesman," believes is "suicidal." Most likely, the settlers are drawing on the fact that Israel itself is the product of a "colonial settlement project," which so far has proved successful; they are expectedly betting also on the "unbreakable" support of the other successful colonial settlement project that has become the United States of America. * Nicola Nasser is a veteran Arab journalist based in Birzeit, West Bank of the Israeli-occupied Palestinian territories. A group of settlers on Monday morning set up a new settlement outpost, as they erected tents in the east of the town of Burin, south of the city of Nablus in the West Bank. Ghassan Daghlas, in charge of Israeli Settlements File in the northern occupied West Bank, said in a statement that a group of settlers from Bracha settlement, set up on citizens' lands east of the town of Burin, started since the early morning hours setting up a number of tents in Zakaka area in preparation for the establishment of a new outpost. A Palestinian citizen was lightly injured from stones thrown at him in West Bank's Binyamin region. The Palestinian was evacuated the Red Crescent for treatment at a hospital in the Palestinian Authority. Dozens of Isreali settlers set fire on Monday evening to Al-Jalud Mount to the south of Nablus, Palestinian sources said. Settlement Activity monitor in the northern West Bank Ghassan Daughlas said settlers from the Ahia settlement set fire to the mountain of Al-Jalud and the fire spread to adjacent Palestinian fields. He added they attacked several houses in Jalud village that led to clashes between Palestinians and settlers, no injuries reported. Settlers' violence against the Palestinian communities and properties is a routine in the occupied West Bank, with settlers enjoying widespread impunity for their crimes. Annual figures compiled by Israeli rights group Yesh Din have repeatedly shown that nine out of 10 police investigations about settler crimes failed to lead to a prosecution. A group of Jewish settlers seized agricultural lands in the Bethlehem village of al-Khader southern occupied West Bank on Saturday. Ahmed Salah, Coordinator of the Popular Committee against the Wall and Settlement in al-Khader village, said that settlers from Elazar settlement, led by the extremist settler Nadia Matar's organization "women in green", have seized an agriculture land belonging to a Palestinian farmer in the village. He added that the settlers confiscated land belonging to Ibrahim Odeh Salah, planted with olive trees. 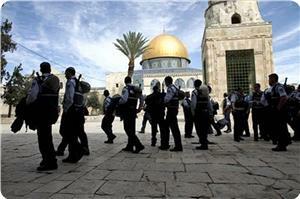 45 Jewish extremists, protected by the Israeli police, stormed on Sunday morning Al-Aqsa mosque. The Israeli occupation forces (IOF) raided at dawn the house of Omar Shalabi, secretary general of Fatah in Jerusalem, and arrested his 13-year-old son. Local sources reported that the forces arrested the boy in a provocative way for unknown reasons. The interior and environment committee of the Knesset intends to table a proposal calling for allowing the Jews to desecrate the Aqsa Mosque to perform their rituals, especially during their religious days and festivals. The website of the Knesset said that the interior committee would discuss the opening of the Aqsa Mosque before the Jews during the holy month of Ramadan and the coming Jewish holidays. The committee is expected to study a request filed by Jewish groups calling for opening all gates and entrances of the Aqsa Mosque before the Jews. The issue of preventing the Jews from entering the Aqsa Mosque during the last holy month of Ramadan will also be debated during this session. Representatives from the ministries of interior, tourism, public security in addition to other Jewish and Zionist groups were invited to participate in this meeting. International rights bodies have time and again warned about the violations of the rights of Palestinian children and teenagers by Israel. However, Israel seems to be turning a blind eye to all warnings, with its forces and settlers carrying on targeting Palestinian youths. A group of Jewish settlers seized agricultural lands in the Bethlehem village of al-Khader southern occupied West Bank on Saturday. 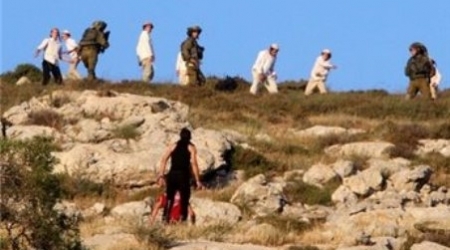 Settlers from Elazar settlement, led by the extremist settler Nadia Matar's organization "women in green", have seized an agriculture land belonging to a Palestinian farmer in the village, said Ahmed Salah the coordinator of the Popular Committee against the Wall and Settlement in al-Khader village. 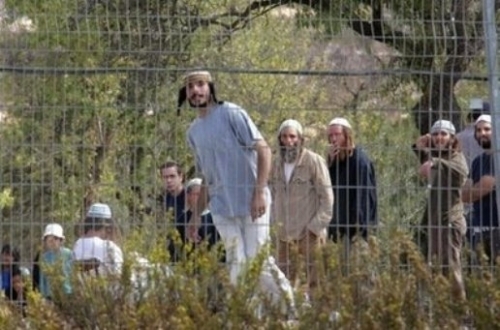 The settlers planted the confiscated land, belonging to Ibrahim Odeh Salah, with olive trees, the local activist added. Jerusalem Mayor Nir Barkat, running for re-election, has big plans for Jerusalem, and none of them has anything to do with dividing it • He says his challenger, Moshe Lion, is supported by backroom wheeler-dealers and does not even live in the capital. When Jerusalem Mayor Nir Barkat was asked in private conversations why he believed that after five successful years on the job, two wily, veteran politicians -- Yisrael Beytenu Chairman Avigdor Lieberman and Shas Chairman Aryeh Deri -- had decided to challenge his position as mayor with their candidate, Moshe Lion, he replied: "There were political wheeler-dealers who tried to find out from me whether they could get what they wanted in exchange for their support for me. My answer to them was an unequivocal 'no.' With me, it is all about transparency. I don't even approach the lines before the illegal line. They can't have their way with me." He declined to provide further details, but added that he later heard that those same anonymous wheeler-dealers had ended up supporting another candidate. Earlier this week, sitting in the living room of his Jerusalem home in the neighborhood of Beit Hakerem, I tried to confront Barkat and find out more about the content of those private conversations. Barkat, as expected, spoke with great caution. "I was asked to make appointments that I was not prepared to make, because my commitment is not to the political system, and not to this or that individual, but only to the residents of the city. Maybe some people want to go back to the way things once were. It won't happen with me," he says. Recently, an alarming study suggested that one out of every 10 Israelis who file a request for a construction permit also offer a bribe along the way. Court records reveal that at least some of the clerks working in Jerusalem have been apprehended and prosecuted for such crimes. This study was even more significant in light of the recent Holyland affair (overg the construction of the enormous Holyland housing complex in the city), which saw two former Jerusalem mayors -- Ehud Olmert and Uri Lupolianski -- investigated on suspicion of taking bribes in exchange for advancing the project. "Fortunately," Barkat says with half a smile, "the fool who can convince me to take a bribe has not been born yet." "Every suspicion has been fully investigated," he says. "I encourage anyone who wants to complain of corruption to come forward. They will get my full support as well as the support of the entire city mechanism, the prosecution and the police." Barkat prefers not to expand on Moshe Lion, the candidate running against him in the upcoming mayoral election. "I have been a resident of this city for 53 years. My children grew up here. I have proved myself in the private sector, and I have proved myself in the public sector as well in the last five years. If you want, you can describe me now as a 'public entrepreneur,'" he says. Lion, Barkat adds, is not a resident of the city. In Barkat's view, this makes his opponent, a one-time director-general of the Prime Minister's Office (during Benjamin Netanyahu's first term as prime minister in 1996), unsuitable for the position of Jerusalem mayor. Barkat argues that bringing a candidate in from outside the city doesn't look good. "Tell me who your friends are, and I'll tell you who you are," Barkat says. "Any semi-intelligent person knows that this is a case of someone hooking someone else up with a job -- a political deal intended to advance personal agendas. "If that is not the case, then please explain to me why they went for a non-Jerusalem resident. I am from Jerusalem. Today, tomorrow, always. For me, Jerusalem is not a political appointment or a job -- it is my life's mission. For 12 years [as a city councilman before becoming mayor] I have been working for a salary of one shekel per year. Every day I wake up in the morning with only one thing driving me: the privilege of serving Jerusalem." Five years ago, Barkat went up against Meir Porush -- currently an MK on behalf of United Torah Judaism -- and Russian-Israeli businessman Arcadi Gaydamak for the position of mayor. Gaydamak was viewed as a bit of an oddity in the Israeli political landscape: Despite his financial contributions during the 2006 Second Lebanon War and despite having purchased the city's soccer team Beitar Jerusalem, he won only 10,000 votes. Barkat, on the other hand, got 117,000 votes -- 52 percent of the total -- and won the election. During the campaign, an internal conflict within the ultra-Orthodox community prompted the prominent Gerer hassidim to shift their support from Porush to Barkat. At that point, the gap between Barkat and Porush stood at 24,000 votes, so clearly that was not the reason for Barkat's victory (contrary to claims made by Lieberman). The reason, apparently, was the high secular turnout as well as the changes Barkat had effected within the national religious sector. "In the past, the national religious population would generally vote for the haredi [ultra-Orthodox] candidates," Barkat explains. "But now, the trend has completely reversed." Proving his point, Barkat presents the latest poll, which suggests that about 80% of the national religious population supports his candidacy. In the last election, Barkat's victory was achieved in part by a clear, precise campaign, warning voters of the danger that a haredi mayor would pose to the character of the city. The campaign suggested that Porush wanted to win the mayor's post to impose his vision on the city. Today, things are a little more complicated. Barkat faces Lion, who is not haredi but does have the support of the haredim as well as the support of the political wheeler-dealers -- double support that Barkat sees as a double threat. Q: Does the deal between Lieberman and Deri possess any real power? "It is a back-channel deal that the public isn't buying. The residents of Jerusalem are smart enough to see things as they really are. This deal is based on an antiquated worldview that may be more suitable for party primaries or shady transactions." When Barkat is asked whether he was concerned about the possibility of the haredi rabbis joining forces and collectively supporting a different candidate, he focuses his stare and reminds the inquirer that the combined force that exists in Jerusalem, and should be the force driving it, is a Zionist combination of secular, traditional and religious Zionist individuals who, according to his account, support him unwaveringly. What about the haredim? Many of them are also rooting for him, he notes, adding that he has never deprived any sector in the city. According to Likud sources, last week Likud Director-General Gadi Arieli called Lion and asked him to remove the Likud-Beytenu logo from his campaign posters. Lion has been endorsed by Lieberman, the chairman of Yisrael Beytenu, and enjoys the support of certain Likud activists in Jerusalem, but he has not been officially endorsed by Netanyahu, who is Likud chairman as well as prime minister. In addition, after Barkat, the party list includes a number of well-known Jerusalem Likud members: Kobi Kahlon, the brother of former Likud minister Moshe Kahlon; successful supermarket owner and businessman Rami Levy; and Meir Turjeman, a well-known figure and, up until recently, an opponent of Barkat's. Likud officials have decided not to hold a primary election to select a municipal candidate for the Jerusalem election and to refrain from running any candidates. So far, Netanyahu has not endorsed any of the candidates. Meanwhile, to make it harder for Netanyahu to support Barkat, a local Likud branch has recently spearheaded a motion, filed with the party's top steering committee, to approve the merger between Likud and Yisrael Beytenu in the Jerusalem municipal elections. The decision is still pending the approval of the Likud's legal adviser, followed by Netanyahu's approval. If it passes, and Likud ends up selecting a candidate, this candidate will run on behalf of both Likud and Yisrael Beytenu. Why has Netanyahu so far avoided publicly endorsing you? "I'll start by saying that my relationship with him is excellent. He has remarked, more than once, that he is very pleased with the changes that this city is undergoing. He is a resident of Jerusalem; he knows the city. His wife is here, and his children are growing up here. I enjoy the prime minister's full support for the welcome changes happening in the city. The secret of the success of these changes is the cooperation between the government and the municipality. This is an opportunity for me to thank him for the support and the resources. He has also said very clearly that he does not endorse Moshe Lion. Will it go any further than that? That is up to him." And thus, local and national politics collide. Jerusalem, because of its significance and centrality as Israel's capital, has never remained solely within the bounds of local politics. Barkat's and Netanyahu's joint course began many years ago. Barkat has voiced his faith in Netanyahu's ability to keep Jerusalem united many times along the way. Now that Netanyahu has relaunched peace talks with the Palestinians, raising once again core issues like the unity of Jerusalem for debate, Barkat continues to give Netanyahu his complete support. As everyone knows, Barkat has been very consistent in his strong opposition to dividing the city or handing over any part of its municipal territory to the Palestinians. "I am not concerned," he says. "I know what the prime minister's position is, and what the government's position is, and of course what the majority of the public thinks about the centrality and unity of the city under any future deal, if there is such a deal." How do you propose handling the Palestinian designs on Jerusalem? "If the deal collapses because it hinges on the Jerusalem issue, so be it. It is better not to make any deal than to agree to a bad deal," Barkat says. Jerusalem is the largest city in Israel. It possesses enormous economic potential, and its main growth engine rests on tourism. 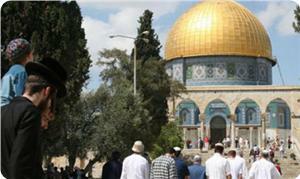 Some 4 million foreign tourists visit Jerusalem every year. The prime minister and the mayor have an identical goal: to raise the number of annual tourists to 10 million. Tourism represents the creation of jobs in a variety of areas and helps the city deal with the unflattering statistics indicating high rates of poverty in certain parts -- parts in which the state invests very few resources in efforts to improve. This obviously affects the municipality, which, at the end of the day, ends up bearing the cost of the municipal tax exemptions handed out by the state to a relatively large portion of the population in the city. These exemptions amount to around 550 million shekels ($155 million) in lost municipal revenue annually, and the state does not compensate the municipality for this loss. "The state decided that certain people, with lower socio-economic status, are exempt from paying municipal tax. I accept that. But the state needs to compensate the city so that it can close the consequent gap," Barkat says. Even though there is still no state compensation, Barkat boasts a balanced municipal budget. 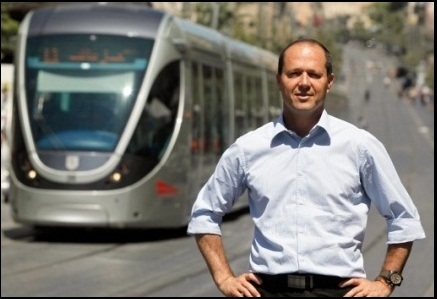 Barkat's vision for the next five years is a new master plan focusing on unemployment and public transportation. He plans to build an enormous commercial center at the entrance to the city, the planning stage of which lasted three years and is now in the final stages of approval. The center will contain a million square meters (10.7 million square feet) in 13 35-story towers. The development cost is assessed at 1.2 billion shekels. In Barkat's vision, the center will be inaugurated at around the same time as the new fast rail connecting Tel Aviv and Jerusalem. Also in the works: the development of two light rail lines -- costing 15 billion shekels ($340 million) -- in addition to the line that is currently in service. This time, he promises, all the ills of the existing line will have been eliminated, and the development will be overseen by the city rather than an external company. Currently, in a city with a population of 800,000 people and tens of thousands of visitors and commuters, the light-rail train hosts some 130,000 passengers every day. The planned new lines will link Gilo to Givat Ram to French Hill and the Mount of Olives. A cable car will then take passengers from the Mount of Olives to the Western Wall and continue to the German Colony. Barkat continues to make the case for what he believes is his successful mayoral term: During his term, the "First Station" (a central entertainment, culture and enrichment hub located in the old train station plaza) was built and Park Hamesila (Train Track Park) was established, as was the Jerusalem Arena adjacent to Teddy Stadium. The Beit Mazia theater was renovated, as was Hansen Hospital (once known as the Lepers' Home). Park Teddy was also built. "Change starts first and foremost with the atmosphere," Barkat explains, immediately mentioning the changes that are currently apparent on the ground. In education, for example, there has been an increase in the number of students enrolled in public and religious public schools. Just this year, 26 new preschools have been opened in the religious Zionist sector. Barkat lifted district restrictions (no longer requiring children to enroll in institutions only in their district) allowing 89% of parents to enroll their children in the schools they wished. Barkat becomes particularly emotional when he talks about the flourishing cultural scene in the city. "Jerusalem's cultural centers have gone from survival mode to blossoming. Jerusalem is experiencing a cultural renaissance," he says. "Residents of Jerusalem understand what a profound change culture has effected in this city in terms of atmosphere, quality of life and the economy. One of the reasons for the growth in the city is that Jerusalem has restored its role as a city of culture. We have surpassed Tel Aviv in terms of the number of cultural events, and today, the road to Jerusalem is no longer a one-way street." Lion's campaign headquarters issued a response saying that "Barkat chased after the haredim in the last election, and it was thanks to them that he won. He continues to woo them today with unprecedented promises worth tens of millions of shekels. At his meeting with Aryeh Deri on June 24, Barkat offered a list of promises to the haredi sector, like the position of deputy mayor and the independence of haredi education. Even Barkat's deputy, Yitzhak Pindrus of United Torah Judaism, said that Barkat has given the haredim more than any mayor before him. "For five years, Moshe Lion worked as the chairman of the Jerusalem Development Authority, working closely with Barkat, and he saw up close [Barkat's] unsuccessful conduct and his disconnection from the residents of the city. Some 90,000 residents have left the city during his term. In education, there has been a decline of dozens of percentage points in eligibility for matriculation exams. The city is ranked 135th in the Meitzav list [a national education index]. The city suffers from dirt and neglect, and in the transportation department, the residents suffer from degraded roads and terrible parking problems. In addition, the price of housing has risen in the city more than any other city in the country." Wadi Hilweh Information Center- Silwan monitored the Israeli violations against Jerusalemites in the city during the month of July in which several arrests took place as well as extremist settlers’ assaults in Al-Aqsa and on the properties of Jerusalemites. The Information Center monitored the arrest of 35 Jerusalemites including minors and a woman where most of the arrests took place during clashes that broke out in the streets of Jerusalem and while suppressing peaceful protests. The month of July also witnessed an Israeli escalation by violating the sanctity of Al-Aqsa Mosque as dozens of settlers raided Al-Aqsa on occasion of the so-called “Destruction of the Temple”, in addition to organizing tours on the outside doors of Al-Aqsa and practicing religious rituals near them. The occupation authorities ordered Zeina Amro, a teacher in Al-Aqsa education program (Masateb), to stay away from Al-Aqsa for three months claiming that she disrupts security and public safety, knowing that she was arrested while being in the Augusta Victoria hospital in Jerusalem; 25-year old Hussam Sider who is an employee of Al-Aqsa Mosque Reconstruction Committee was also ordered to stay away from Al-Aqsa. The Israeli occupation forces also suppressed in July a protest for the prisoners and another one that was against the Prawer Plan and assaulted and attacked the participants and severely beat them using batons, sound bombs and Calvary units. In the context of demolitions in the Holy City, Al-Sharabati family in the old city executed the court’s decision and removed the tin plates from the top of their house in order to avoid evacuation, knowing that the family put the tin plates on the top of the house almost 20 years ago to protect the rooms from the rain. The municipality also handed a demolition order to the family of Jerusalemite prisoner Khaled Shweiki to demolish the balcony of his house since it is built without a permit. Towards the end of last month, a Jerusalemite young man was shot in his foot in Sheikh Jarrah as verbal altercations broke out between him and an Israeli police man who was dressed in civil clothes and ended up shooting him. Settlers continued their assaults on Jerusalemites and their properties as they damaged the windows of several cars at Lions gate and assaulted young men during the so-called “Destruction of the Temple” protest, knowing that the police was present at the scene but did not interfere and prevent the settlers or arrest them. In the context of attacks on lands and properties, a decision to evacuate Siam’s family from their house in the neighbourhood of Sheikh Jarrah was issued, in favor of the settlers. The family has been living in the house since the 1960’s but the Custodian of Absentee Property claims that the family has been living there since 1968 so that they don’t benefit from the protection rights; the Custodian of Absentee Propertyis ordering Siam family to pay 40 thousand NIS to freeze the evacuation. 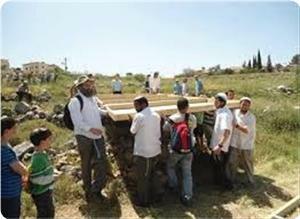 Settlers also tried to seize a land and a house in the neighbourhood of Al-Tur at the beginning of July. They assaulted the residents as well as attacking 53-year old Sami Qalouni and Jamal Abu Steve and injuring them with wounds and bruises. 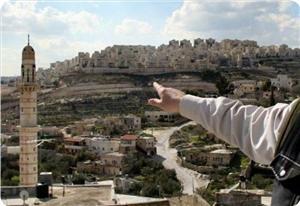 The settlers are also trying to seize a property that belongs to Al-Rweidi family in Al-Ein area in Silwan. The family was surprised when the settlers appealed the District court’s decision which confirmed the family’s ownership of the property that consists of 3 floors (5 residential apartments) and 30 individuals live in it; it is registered under the name of Jom’a Mohammad Salem Darwish Rweidi.